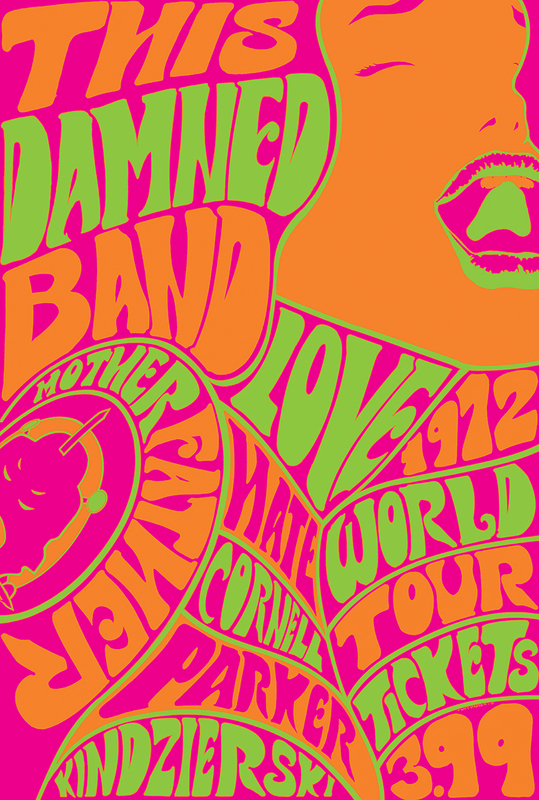 Writer Paul Cornell and Artist Tony Parker, on their new comic book mini-series, This Damned Band (starting this August from Dark Horse Comics). 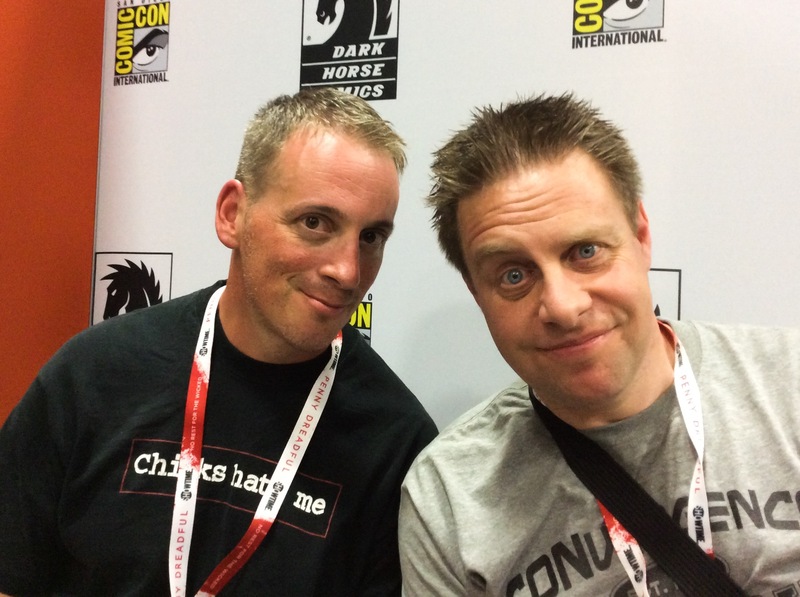 We had fun at the 2015 San Diego Comic Con in chatting with Paul Cornell; award-winning writer of comics, novels, short stories and television screenplays (his Doctor Who episodes “Family of Blood/Human Nature” and “Father’s Day” being among my personal favorites). To my surprise and an awesome bonus, we were joined by Eisner-nominated artist, Tony Parker. Parker has published work with pretty much all the main comic book publishers over the recent years including Marvel, DC, IDW, Image, IDW, Boom!, Dark Horse. From your own introductory perspective, share with us what your new series This Damned Band is all about..
Paul Cornell: This Damned Band is about the biggest rock band in 1974. We like to say in a pretentious British way that they worship the devil only to discover that to their surprise and horror that actually, they worship the devil. It’s a Ghostbusters style horror comedy. It’s told straight to camera like The Office. There are all sorts of different levels to it, as we have people saying one thing and doing another. Interesting. How did this idea come together for Dark Horse to publish? Tony Parker: I was very lucky. What were your personal inspirations in bringing together This Damned Band? Paul Cornell: I really like stories where people are very good at one thing, and blindsided by something completely different. Because in this case, they are insisting all the time they know all about better the thing…there is a certain deliciousness to that, I think.. The timing of the early 70s, where the idea of rock music being fresh is an interesting era and a turning point for pop-culture. Then along comes the devil and the idea of this being his music by some religious groups? What was it for these bands, do you think made this connection as “devil music”? Paul Cornell: Well, there was a point in the 70s where occultism is much more pop than it is now and it’s a really interesting time. Dennis Wheatley is suddenly becoming popular again even before the Exorcist, and the Stones recording, “Sympathy for the Devil.” I think there is a part of the counter-culture also seemed to be against organized religion. And that went quite a lot into what a lot of musicians talked about at the time. I’m sure a lot of it was sheer pretense, and that really intrigues me. I think there is something about people pretending to believe stuff which is really interesting. Tony Parker: That combined with conservatives saying “that’s devil music!” Okay for devil music we will bring it, in fact well make money off it. So with a big counter-culture, we get all the teen money, therefore it adds into it. Tony Parker: All music of the youth..that’s one thing about it. Paul Cornell: That’s what music is for when your 14. But you know, I’m slightly the wrong generation for that, as I was born in 1967..so I was out of my age precisely for the teenage audience, so I missed. But one of my earliest memories is with my brother who is a lot older than me who lived in a squat in London, and I remember going down a flight of stairs and seeing a mural painted on the wall of a cellar which was an enormous devil. I suspect that buried memory has resurfaced for This Damned Band. I would love to see that turn up somehow in this book, perhaps. Tony Parker: We shall find out. Tony Parker: For me ..I lived in a very conservative area so that was anything that wasn’t soft mellow 70s gold. Even though that wasn’t the 70s, it was after the 70s so that was still the devil music. In the 80s and 90s, we had the metal bands, the hair bands, thrash bands, punk bands were all. The only thing that isn’t, (and I love Barry Manilow) that wasn’t Barry Manilow was a tool of the devil. With your fictional band, Motherfather.. I’m sensing an amalgam of different bands here and there but are there any in particular pop bands for you that eclipsed the others in the bringing to fictional life, this band? Tony Parker: And that’s why we did it..part of it was because I wanted to people think..I really love Mick Jagger or I really hate Mick Jagger..so that’s going to affect the story..with more nuances of its got hints of this, or that as a measure of tropes a bit and play with that so they can enjoy the concepts of the character versus the logging in of the specific creator. As the series progresses, what can us readers expect to absorb of this strange world of occultism and rock music? Paul Cornell: One of the joys of this is because it’s all meant to be filmed, there are certain sequences where they couldn’t film it.. So like the road trip in the first issue is related to a local artist who than has to draw it..like when a court reporter has to draw for television on the news. So in Issue 1, the local artist is Japanese..so Tony had the idea of doing it in a manga style. Tony Parker: Which I never drawn manga before..but I love manga. I am a huge Otomo fan and Matsumoto Shiro, and we are trying to find a manga style that was 1972, 73,74 so that we can fit into that as well..and treat it with respect. Paul Cornell: In later issues we go to France so we get some Tintin, and some Windsor McCay in there.. 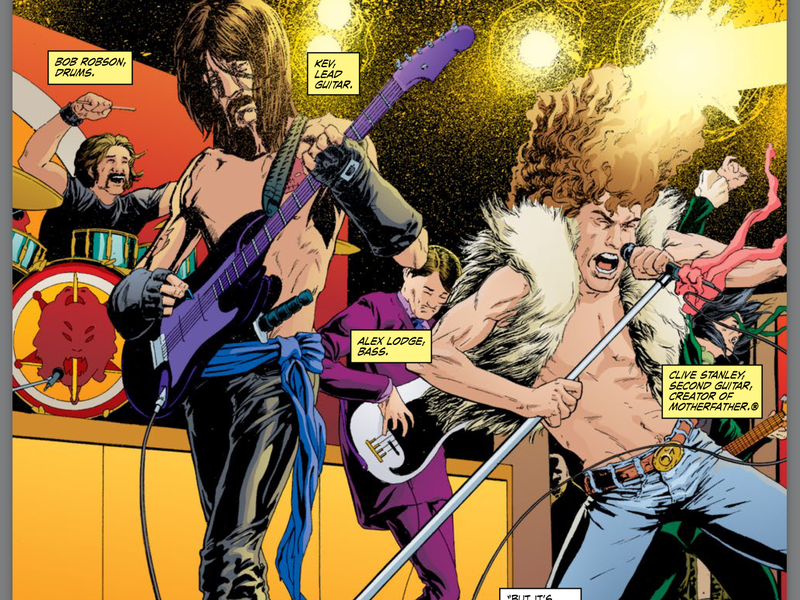 In your plans, is This Damned Band a limited series or are there plans for a continuation for years ahead? Tony Parker: It’s a finite series, and a complete story. I think a lot of people will appreciate that. It’s not a volume 1, with a trailer for 500 issues. You have the whole thing alone which you can enjoy by itself. After this, are there any future projects to your fans and followers of this work to look forward to? Paul Cornell: Coming up in September..I have a novella coming up from Tor.com called called Witches of Lychford, which is about 3 women who are brought together to fight the supernatural evil of a new supermarket chain. Paul Cornell: And, I got a collection of short stories coming out in September called A Better Way to Die. Tony Parker: I can’t say right now but I got a project set up right after this..but I got to say, its got a long history to it..and I’m real excited about it! My curiosity senses are tingling. I look forward to all that and This Damned Band. Thanks for sharing! 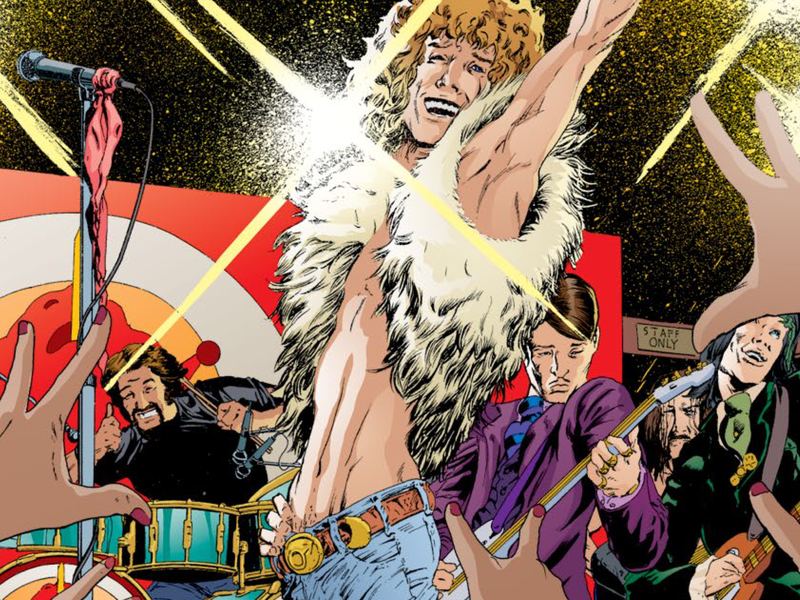 This first issue of This Damned Band is scheduled to come out on August 5th, 2015 and continue monthly for a limited time. Look for it at all the great comic book shops, stands, and digital apps that carry current Dark Horse published titles.